Skeleton Krewe 2019 portraits are now in the Gallery! Just one week to go! 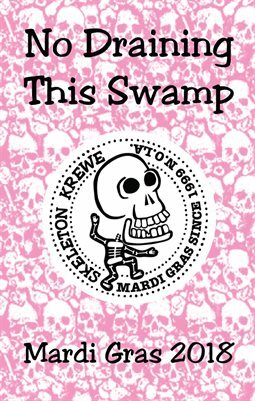 Check out Skeleton Krewe’s Facebook and Instagram this week for lots of pics from Mardi Gras parades gone by, and keep in mind our 2019 parade schedule: we march at the beginning of Krewe d’Etat on Friday night starting at 6:30pm, and then our solo march is Tuesday morning starting around 6:00am, ending at Jackson Square around 8:30. It’s Skeleton Krewe’s 20th anniversary! We’ll be marching in two parades as usual this Carnival season — we’ll be leading Krewe d’Etat on Friday, March 1st, starting at 6:30pm, and then we’ll do our solo march Mardi Gras morning, March 5th, starting at 6:30am and ending at Jackson Square around 8:30am. From there we’ll mosey on over toward Frenchman Street and hang around the street party in front of R Bar after around 10:30am. Come say hi and get yerself a copy of our 20th anniversary zine!! Check out Skeleton Krewe’s Facebook page to see pics and videos of us shakin’ our bones at Bal Masque 2019! For New Orlean’s tricentennial in 2018, Skeleton Krewe dressed up as influential personalities from New Orleans and Louisiana history — factual, fictional, and zoological! See all the Skeleton Krewe 2018 portraits here. Skeleton Krewe flag on the homepage of NOLA.com! Skeleton Krewe’s flag is currently featured on the homepage of nola.com, as well as in this great article: A guide to Mardi Gras flags: Banners fly high during the Carnival season. Skeleton Krewe will march in two parades this Carnival season — we’ll be leading Krewe d’Etat as usual on Friday, February 9th, starting at 6:30pm, and we do our solo march Mardi Gras morning, February 13th, starting at 6:30am and ending at Jackson Square around 8:30am. Then we’ll wander over toward Frenchman Street and hang around in front of R Bar after around 10:30am. We have brand new throws this year; come find us and say hi!